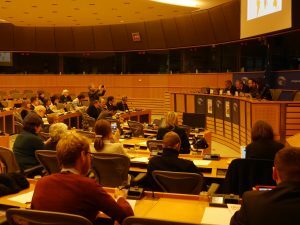 Today, the International Humanist and Ethical Union (IHEU) presented the 2016 Freedom of Thought Report during a meeting in the European Parliament, hosted by Dennis de Jong, MEP and co-Chair of the Intergroup on Freedom of Religion or Belief. De Jong: ´The report shows a gloomy picture for those who do not adhere to a dominant religion. Persecution by the authorities, lack of protection against violence from extremist forces, and the rise of nationalistic populism have further undermined the situation of non-theistic and atheistic beliefs in many parts of the world. It is time for the EU High Representative, Federica Mogherini, and the Member States to step up their actions to promote and protect the freedom to manifest not only theistic, but also non-theistic and atheistic beliefs´. IHEU´s country profiles clearly show that in a growing number of States, the authorities identify themselves with one dominant religion and do not respect the rights of minority religions and non-religious beliefs. De Jong: ´It is shocking to see that the situation in countries like Iran and the Maldives, the leaders of the dominant religion actually run the country, leaving no room for manifestations of other beliefs´. The second threat for adherents of non-religious beliefs originates in the increasing violence by extremist religious forces in a number of countries. De Jong: ´Although freedom of religion or belief includes the obligation for the State to protect anyone professing a religion or belief from violence by third parties, many governments do not offer this protection. During the event, Ms. Fauzia Ilyas tells us about the death threats that she received as founder of the Agnostic and Atheist Alliance in Pakistan and the lack of protection offered against these threats by the Pakistani government´. A new phenomenon is the rise of populist nationalism going hand in hand with restricting the rights of those who do not adhere to the national religion. De Jong: ´The combination of nationalism and a dominant national religion is a dangerous cocktail. We see this in India, with the Hindutvar Nationalist Movement, but also in countries like Russia and Moldova where the ties between the governments and the Orthodox Church have become unhealthy’. 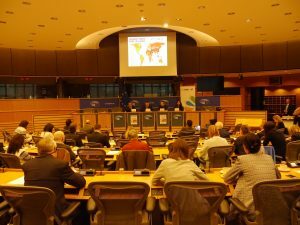 EPWG on FoRB hosting a Pa... EPWG on FoRB Co-Presidents Peter Van Dalen and Dennis De Jong and the EPWG on FoRB held a meeting with a Pakistani Delegation in the European Parliament.